Irish sing-along and a spot of ceili dancing. Maria’s idea to weave a one-woman show entitled “Exotic tales and dances from Celtic literature,” was surely influenced by the fact that her mother was Irish and father was Scottish, bringing her insights into both cultures. Having studied voice and speech at the Gaiety school of acting Dublin she became aware of the beauty of good diction and interpretative phrasing and these texts from the Masters were ideal for honing articulation. 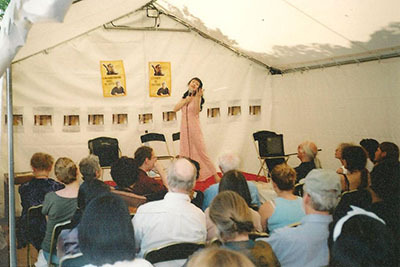 In Paris, as well as performing, Maria passes on these techniques as an English teacher of the Tomatis method at Fréquences Langues. Storytelling at Shakespeare & Company in Paris. In awe of these masters, her greatest aspiration is to do justice to their compelling genius, bringing these works vibrantly to life. Those who have seen her performances would add that if James Joyce, Oscar Wilde or Robert Burns were around today, they would be proud of Maria’s performances of their works. She renders the literary works accessible, irresistible and exuberant. Many spectators say that it’s the first time they have fully understood the piece, for she brings out humanity and credibility, since women are after all a hive of contradictions, just like men. The parts are a celebration of femininity and womanly wiles. Maria is a trained Arabian Belly Dancer and has performed to many an Irish audience, appeared on Irish TV and is now delighting The French International set by mixing in the magic of dancing in veils with the opium of pure literature. A reading of Gerty MacDowell at a Bloomsday festival at the Shakespeare & Company bookshop. Maria D’Arcy put on a performance of Oscar Wilde’s Salomé on Saint Patrick’s Day 2003 on Bateau Daphne, a boat on the river Seine in Paris, and again on February 23rd 2015 at Le Chat Noir; in 1999 she performed the Tam O’Shanter by Robert Burns at the Irish Cultural Center. Watch an interview with Maria D’Arcy about her origins and the transition from Dublin to Paris, with Jilliana Ranicar-Breese.